You don’t have to look far this season to see that Nautical is having a moment. Actually, it always seems to be having a moment every summer. 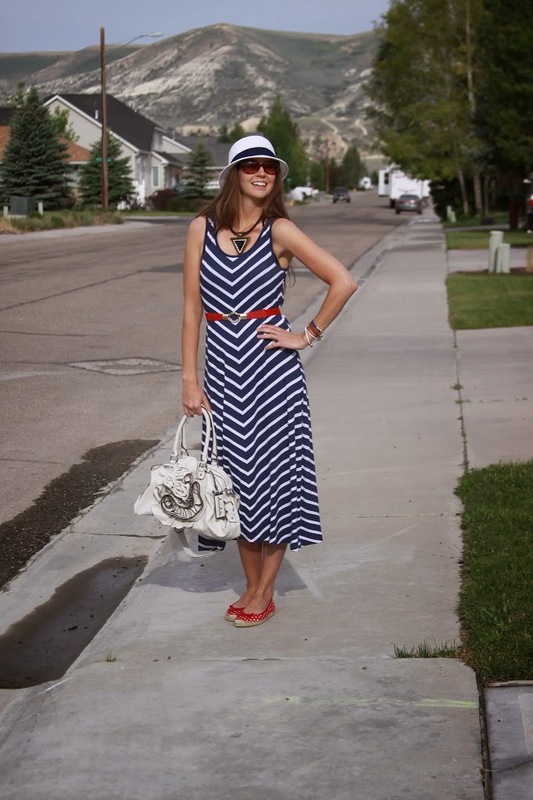 There’s something about warm weather and lovely nautical prints, and the glamorous mix of blue and white. Chevron stripes are also still going strong, and midi-skirts and dresses (skirts and dresses that hit mid calf) are hot this season too, so I was absolutely in love when I saw this beautiful chevron print midi-dress in nautical blue and white from Charlie Paige. It’s amazingly soft and comfortable too! I’m actually new to the Charlie Paige fashion line, (you can find them on GiftCraft) but have been nothing short of impressed! Their fashion is completely on-trend, chic, high quality, and yet completely affordable! You can find so many beautiful styles for all sizes and shapes, and for all four seasons! They also have a great line of fashion accessories you absolutely must check out as well! Speaking of Charlie Paige accessories, I’m completely obsessed with their super chic printed rain boots, especially the Union Jack Boots. But boots aren’t all you’ll find at Charlie Paige! I got to try out a super cute hat, belt, and bracelets as well! The hat is so fun and playful, and to be honest, I’m not a hat girl at all. I mean, I wear a big wide brim hat in the summer to keep the sun off my face and keep those dreaded sun spots away, but you won’t catch me out and about in a hat. But when this super chic white hat with blue ribbon detail showed up from Charlie Paige, I can’t take it off! This is probably the first time I looked at pictures of myself in a hat and thought, hey that turned out pretty cute! I’m actually kind of obsessing over this hat currently and it’s such a perfect, comfortable, chic hat to wear all summer long! Remember those fun belts you wore as a kid, where you slide the left buckle into the right side at an angle and it clasps and holds the belt in place. I haven’t worn a belt like this since I was a kid, I haven’t even seen them anywhere else in like 20+ years! But Charlie Paige has got them and I’m completely obsessed. The belt takes two seconds to get in and out of, stretches to fit you perfectly, and you have no annoying strap left over, you have to figure out how to tuck away. 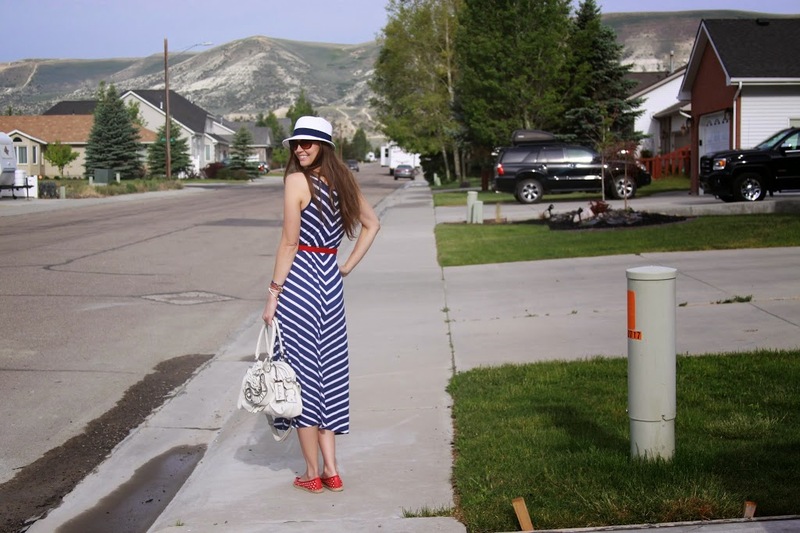 I love the cute bright red and how well it goes with the blue and white striped dress too! The belt is incredibly comfortable and stays on fabulously! Wrap bracelets are all the rage right now, so I was also excited to get four rope wrap bracelets with gold clasps, in red, blue, white, and brown. I don’t always wear clasp bracelets because usually you need someone to help you get in and out of them, right?! These bracelets couldn’t be easier to put on and take off all by yourself. The gold clasps have a slit where you slide one into the other. Takes about 2 seconds to put on and take off! I did notice they can come undone a little easily, but the higher up you wear them on the arm, the better stay on. Plus, you can also clasp them together to make one bracelet or even wear it that way as a necklace! They are a great, completely versatile piece of jewelry! Isn’t my Charlie Paige fashion gorgeous? I love the look of all of it together and decided to stay with the red, blue, and white color scheme, and added red polka dot flats, and a vegan leather white handbag with rose detail. When I put on this outfit, I got the pictures taken right away, then I ran to the grocery store to pick up a few things for the weekend, and the first person I saw, actually got off her cell phone for a second to tell me how much she loved my dress. You know your look is great when the first person you see actually covers her phone to tell you how much she loves your dress, right?! Needless to say, I was even more thrilled with my look, even though I was absolutely obsessing over the Charlie Paige dress and accessories anyway! I’ve been shopping more of the Charlie Paige fashion and I’m absolutely smitten. I know you will be too! They have such chic, trendy, comfortable pieces to wear, you will never want to take them off! *I was given these products for the purpose of review, however, all thoughts and opinions expressed in this post are solely my own. I only share reviews with my readers, I feel will be beneficial or informative to them in some way. You look gorgeous! I love, love, love that dress and the accessories! That hat is super-cute! I don’t usually like hats myself. Thanks for all your support and comments! Of course!! You are one of my favorite bloggers! I always get new ideas on how to style my clothes.. so thank you girlie. Awesome outfit! Love the color combo!